Startup Forum is an online network arena for entrepreneurs with international background living in Akershus who want to learn how to start a business in Norway. The programme is based on a methodology developed through a regional innovation program funded by Akershus fylkeskommune and Asker kommune. Startup Forum 2017 is arranged by Askershus Næringshage in colloboration with Inclusion AS and Campus Nooa. Funders of the 2017 are Asker kommune and Bærum kommune. Participation is FREE. This year´s programme will start in September (exact date is yet to be set) land will last until 31.12.2017. By participating in Startup Forum the startups will get a basic understanding of what it takes to quickly establish your enterprise in Norway, get access to a large collection of all the startup tools (necessary documents, check lists, «how-to» videos» etc.) in one place. Another benefit of participating in Startup Forum is that the participants will get individual tailor-made mentor assistance helping them to progress with their business project. All communication in the Startup Forum arena is in English and participation is free. Startup Forum was arranged for the first time in 2015 and the second round was held in 2016. Participants come from nearly 30 nations including New Zealand, India, Thailand, Peru, Brazil, Serbia, UK, Spain, China, India, Philliphines, USA, Norway and Australia. A lot of practical startup tools tailormade for entrepreneurs with foreign background living in Norway. This includes templates of the most relevant documents you need in the startup process, several how-to-videos (for example: «How to register an enkeltpersonforetak?», «How to find an accountant?», «How to do a simple market survey in Norway?») checklists on what to do regarding business obligations related to accounting, book keeping , taxation and VAT as well as step-by-step guides for marketing and sales activities , easy-to-use business model tool, a simple business plan etc. Access to at least 1 physical gathering presenting a very relevant startup issue. This arena will also be a place for network with other likeminded entrepreneurs. Access to the Startupforum in 12 months from course start the 1st of November. The course methodology is in addition to the development based on two pilot projects taking place in 2015 and 2016 based on experience from many years of digital learning and main issues facing entrepreneurs at the early stages of their start-up experience. The start-up course is organised into four study modules. At the end of modules there is an assignment to be submitted for evaluation, with the purpose of helping the entrepreneurs to progress in their start-up efforts. Module 3. How to sell in Norway? People with entrepreneurial aspirations living in either Akershus or Oslo who either are in their early stages of startup or are considering starting up their own business. All resources you need for the startup course are online and included in the course. This will typically include checklists, development tools, instructional videos and a lot of other useful startup tools. The pilot course is free. When you have passed the final assignments, you will receive an Open Badge verifying your Course completion. Your badge is shown in the picture and you will receive a link to your personal badge. If you like, you can share your badge on LinkedIn, Facebook etc. Startup Forum 2017 vil take place Autumn 2017. You will have access to the startup course and startup tools during the whole programme period. Participation includes a physical kick-off gathering taking place in Asker sometime in Septemberr from 5pm to 8pm. (exact location is not yet set). 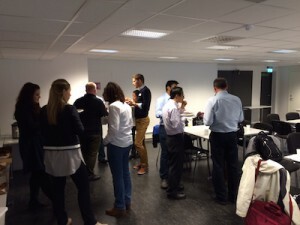 At this gathering you will learn about business modeling, you will connect with the other startups as well as being served a light meal, snacks and drinks. 1. Send an email to paul@inclusion.no writing «Startup Forum 2017» in the email subject line. The enrollment takes place on an on-going basis. Please contact us on paul@inclusion.no or telephone (+47) 400 888 14 if you have questions.